(/ˌpɑrmɪˌdʒɑːnoʊ rɛˈdʒɑːnoʊ/; Italian pronunciation: [ˌparmiˈdʒaːno redˈdʒaːno]), or Parmesan cheese, is a hard, granular cheese. It is named after the producing areas, which comprise the Provinces of Parma, Reggio Emilia, Bologna (only the area to the west of the river Reno), Modena (all in Emilia-Romagna), and Mantova (in Lombardia, but only the area to the south of river Po), Italy. Under Italian law, only cheese produced in these provinces may be labelled “Parmigiano-Reggiano”, and European law classifies the name, as well as the translation “Parmesan”, as a protected designation of origin. Parmigiano is the Italian adjective for Parma and Reggiano that for Reggio Emilia. In the U.S., Canada, and other countries outside the EU, the name “Parmesan” is generally only used for cheeses similar to Parmigiano-Reggiano, with the full Italian name used for traditional Parmigiano-Reggiano cheese. Parmigiano-Reggiano is made from unpasteurized cow’s milk. The whole milk of the morning milking is mixed with the naturally skimmed milk (which is made by holding milk in large shallow tanks to allow the cream to separate) of the previous evening’s milking, resulting in a part skim mixture. This mixture is pumped into copper-lined vats (copper heats and cools quickly). Starter whey (containing a mixture of certain thermophilic lactic acid bacteria) is added, and the temperature is raised to 33–35 °C (91–95 °F). Calf rennet is added, and the mixture is left to curdle for 10–12 minutes. The curd is then broken up mechanically into small pieces (around the size of rice grains). The temperature is then raised to 55 °C (131 °F) with careful control by the cheese-maker. The curd is left to settle for 45–60 minutes. The compacted curd is collected in a piece of muslin before being divided in two and placed in molds. There is 1100 L (291 US gallons or 250 imperial gallons) of milk per vat, producing two cheeses each. The curd making up each wheel at this point weighs around 45 kg (100 lb). The remaining whey in the vat was traditionally used to feed the pigs from which “Prosciutto di Parma” (cured Parma ham) was produced. The barns for these animals were usually just a few yards away from the cheese production rooms. The cheese is put into a stainless steel, round form that is pulled tight with a spring-powered buckle so the cheese retains its wheel shape. After a day or two, the buckle is released and a plastic belt imprinted numerous times with the Parmigiano-Reggiano name, the plant’s number, and month and year of production is put around the cheese and the metal form is buckled tight again. The imprints take hold on the rind of the cheese in about a day and the wheel is then put into a brine bath to absorb salt for 20–25 days. After brining, the wheels are then transferred to the aging rooms in the plant for 12 months. Each cheese is placed on wooden shelves that can be 24 cheeses high by 90 cheeses long or about 4,000 total wheels per aisle. Each cheese and the shelf underneath it is then cleaned manually or robotically every seven days. The cheese is also turned at this time. 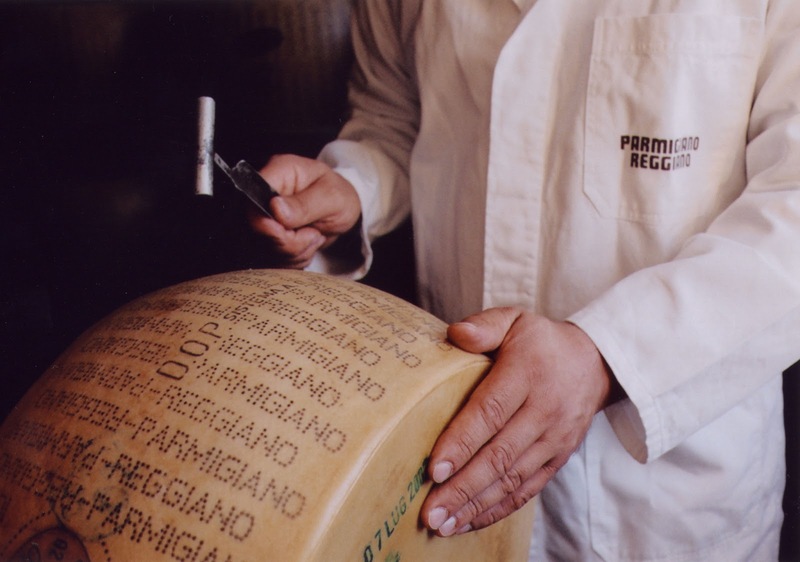 At 12 months, the Consorzio Parmigiano-Reggiano inspects every wheel. The cheese is tested by a master grader who taps each wheel to identify undesirable cracks and voids within the wheel. Wheels that pass the test are then heat branded on the rind with the Consorzio’s logo. Those that do not pass the test used to have their rinds marked with lines or crosses all the way around to inform consumers that they are not getting top-quality Parmigiano-Reggiano; more recent practices simply have these lesser rinds stripped of all markings. The only additive allowed is salt, which the cheese absorbs while being submerged for 20 days in brine tanks saturated to near total salinity with Mediterranean sea salt. The product is aged an average of two years. The cheese is produced daily, and it can show a natural variability. True Parmigiano-Reggiano cheese has a sharp, complex fruity/nutty taste with a strong savory flavor and a slightly gritty texture. Inferior versions can impart a bitter taste. The average Parmigiano-Reggiano wheel is about 18–24 cm (7.1–9.4 in) high, 40–45 cm (16–18 in) in diameter, and weighs 38 kg (84 lb). Good info. Lucky me I found your website. I just want to mention I am just very new to weblog and truly liked you’re website. Most likely I’m going to bookmark your site . You surely have fabulous articles and reviews. With thanks for sharing with us your web page.